As has already been stated, compomers resemble traditional composite resins in that their setting reaction is an addition polymerization. It is usually light-initiated, and the initiator is camphorquinone with amine accelerator, and as such is sensitive to blue light at 470 nm . There is, however, at least one brand, designed for use as luting cement, Dyract Cem, that is a two-paste system. Cure is brought about as a result of mixing the two pastes, each of which contains a component of the free radical initiator system. The set material, though, does not differ in any fundamental way from those compomers that cure photochemically. A key feature of compomers is that they contain no water and the majority of components are the same as for composite resins. Typically these are bulky macro-monomers, such as bisglycidyl ether dimethacrylate (bisGMA) or its derivatives and/or urethane dimethacrylate, which are blended with viscosity-reducing diluents, such as triethylene glycol dimethacrylate (TEGDMA). These polymer systems are filled with non-reactive inorganic powders, such as quartz or a silicate glass, for example SrAlFSiO4. These powders are coated with a silane to promote bonding between the filler and the matrix in the set material. In addition, compomers contain additional monomers that differ from those in conventional composites, which contain acidic functional groups. The most widely used monomer of this type is so-called TCB, which is a di-ester of 2-hydroxyethyl methacrylate with butane tetracarboxylic acid . This acid-functional monomer is very much a minor component and compomers also contain some reactive glass powder of the type used in glass-ionomer cements [25, 50]. Despite the presence of these additional components, compomers are similar to composite resins in that they are fundamentally hydrophobic, though less so than conventional composite resins. They set by a polymerization reaction, and only once set do the minority hydrophilic constituents draw in a limited amount of water to promote a secondary neutralization reaction . They lack the ability to bond to tooth tissues, so require bespoke bonding agents of the type used with conventional composite resins, and their fluoride release levels are significantly lower than those of glass-ionomer cements. 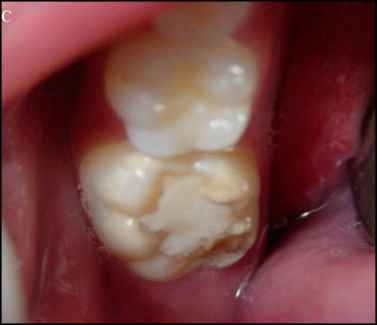 Such low levels of fluoride release have been shown to compromise the degree of protection afforded by these materials in in vitro experiments using an artificial caries medium .